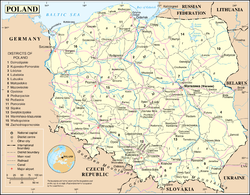 ^a The aurie o Poland, as gien bi the Central Statistical Office, is 312,679 km2 (120,726 sq mi), o that 311,888 km2 (120,421 sq mi) is laund an 791 km2 (305 sq mi) is internal watter surface aurie. ^b The adoption o Christianity in Poland is seen bi mony Poles, regairdless o thair releegious affiliation or lack thareo, as ane o the maist signeeficant events in thair kintra's history, as it wis uised tae unifee the tribes in the region. The Republic o Poland (Pols: Rzeczpospolita Polska), for ordinar kent juist as Poland (Polska), is a kintra in central/aestren Europe. It mairches ontae the Baltic Sea tae the north, alang wi the Kaliningrad Oblast o Roushie. Lithuanie mairches tae the nor-aest, Beloroushae tae the aest, Ukraine tae the sooth-aest, Slovakie an Czechie tae the sooth, an Germany tae the wast. The haill area o Poland is 312,679 km², makkin it the 69t lairgest kintra i the warld and 7t in Europe. Poland's population is mair nor 38.5 million, concentratit mainly around the ceities. The first Pols state wis stertit i 966, in a territory similar tae the present area o Poland. Poland becam a kinrick i 1025, an i 1569 it cementit a lang associe wi the Grand Duchy o Lithuania by unitin ti form the Polish-Lithuanian Commonweal. The Commonweal collapsed i 1795. Poland regained its independence i 1918 eftir the Furst Warld War bit tint it aince mair i the Saicont Warld War, bein occupied bi Nazi Germany an the Soviet Union, an emergin eftir as a communist kintra in the Eastern Block under the control o the Soviet Union. I 1989, communist rule wis owerthrawn an Poland becam whit is informally kent as the "Third Polish Republic". Poland is the 33rd maist populous kintra in the warld. 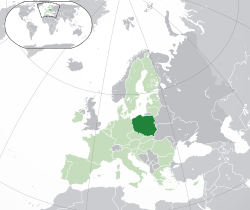 Poland is a unitary state made up o saxteen voivodeships (Polish: województwo). Poland is a memmer o the European Union, NATO, and OECD anaw. ↑ Constitution o the Republic ofPoland, Airticle 27. ↑ "Wyniki Narodowego Spisu Powszechnego Ludności i Mieszkań 2011" [Results of the National Census of Population and Housing 2011] (PDF). Central Statistical Office (in Pols). March 2012. Archived frae the oreeginal (PDF) on 16 January 2013. ↑ "Concise Statistical Yearbook of Poland, 2008" (PDF). Central Statistical Office (Poland). 28 July 2008. Archived frae the oreeginal (PDF) on 28 October 2008. Retrieved 12 August 2008. Wikimedia Commons haes media relatit tae Poland. This page wis last eeditit on 19 Dizember 2017, at 09:33.